Sen. Orrin Hatch (R., Utah), a member of the Judiciary Committee, on Monday accused Senate Democrats of coordinating a political attack on Supreme Court nominee Brett Kavanaugh. Hatch reiterated his desire for California professor Christine Blasey Ford to testify about her allegation of attempted sexual assault, but in a statement he excoriated Democrats for insinuating Kavanaugh’s guilt without evidence and seeking out suspect accusers to smear him. However, he said a new accusation from Deborah Ramirez, who attended Yale with Kavanaugh, was thinly sourced and fits the pattern of a Democratic "smear campaign." Kavanaugh has categorically denied all the accusations. Sen. Dianne Feinstein (D., Calif.) also did nothing with Ford’s letter, which she received in July, until after Kavanaugh’s hearing concluded. Hatch said Feinstein's bahavior shows Democrats’ motives are dishonest. "The way my Democratic colleagues have approached these allegations makes clear that the driving objective here is not truth, but politics. Rather than working with Republican colleagues to investigate Dr. Ford’s allegations, they sat on them for six weeks until the eve of Judge Kavanaugh’s confirmation vote and then leaked them to the press," he said. "Rather than bringing last night’s allegations to the attention of committee investigators, they back-channeled them to the media and then denied any involvement." Hatch said this is problem for the country. "Such underhanded tactics are not fair to Judge Kavanaugh, are not fair to the individuals in the stories, and are not fair to the American people," Hatch said. Ramirez’s story was reported by The New Yorker despite a lack of corroboration that kept the New York Times from publishing her accusation. Democrats have subsequently called for further delays in Kavanaugh’s confirmation process, which Hatch considers illegitimate. "Senate Democrats will stop at nothing to prevent Judge Kavanaugh’s confirmation. As reported by the author of last night’s article, the individual in the piece came forward only because Senate Democrats ‘came looking.’ And even then, the individual went on the record only after ‘six days of carefully assessing her memories and consulting with her attorney,’ a former Democratic elected official," Hatch said. "The New York Times, which declined to publish the allegations when approached, reported that it had interviewed ‘several dozen people in an attempt to corroborate the story’ and could find ‘no one with firsthand knowledge.’"
Hatch contends Democrats are using a dirty political playbook in their opposition of Kavanaugh rather than vetting the allegations fairly. "No innuendo has been too low, no insinuation too dirty. Everything is an excuse for delay, no matter how unsubstantiated. It does not matter that no other eyewitness can even confirm that Judge Kavanaugh was at the party in question," he said. "It does not matter that every other individual alleged to be present denies any memory of the event. The goal is delay." With that in mind, Hatch called on the committee to hear Ford’s testimony and then vote on Kavanaugh’s confirmation. "Senate Democrats are demeaning both the Senate and the Supreme Court through their partisan games and transparent attempts at character assassination. We should hear from Dr. Ford on Thursday as planned. Then we should vote," Hatch said. Sen. Mazie Hirono (D., Hawaii) is one of many saying she believes the allegations against Kavanaugh, and she even admitted that his judicial philosophy stops her from giving him the presumption of innocence. 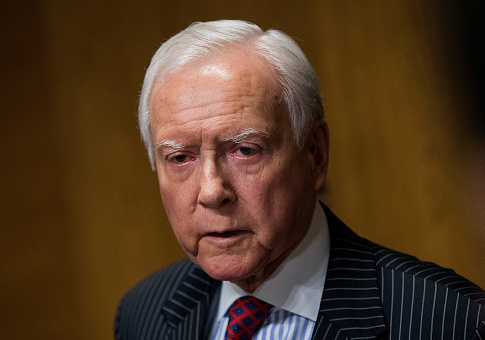 Hatch's sentiments were echoed by Senate Majority Leader Mitch McConnell (R., Ky.) during a floor speech Monday afternoon. This entry was posted in Politics and tagged Brett Kavanaugh, Democratic Party, Dianne Feinstein, Mazie Hirono, Orrin Hatch. Bookmark the permalink.